The Professional Bull Riders have chosen MultiDyne's LiGHTCuBE fiber-optic field transport system to broadcast their action packed bull riding events. Installed by ProVideo Systems — a full-service professional video, television, and production equipment dealer and systems integrator — MultiDyne's LiGHTCuBE is a fully customizable, rugged, and high-density solution that supports a wide range of signals, including composite, HD video, PL, IFB, audio, and more. Utilizing LiGHTCuBE, PBR can support up to 80 HD-SDI, SDI, or any combination of composite video, audio, data, and PL, over a single fiber-optic cable. PBR produces hundreds of events each year across the United States and around the globe. "PBR produces hundreds of events each year across the United States and around the globe, making it critical that we have a fiber-optic field transport solution that is dense, durable, compact, and easy to travel with," said Dan Hickman, senior director of tour operations, Professional Bull Riders. "MultiDyne's LiGHTCuBE supports a high signal count from a small, portable design that is tough in any environment. It's perfect for our remote broadcast needs." ProVideo Systems of Perrysburg, OH, provided integration, design, and consultation support for PBR. Kevin Olden, VP of engineering said, "When PBR needed a product for the 'Toughest Sport on Dirt,' I thought of MultiDyne. In Thackerville, Oklahoma, in temps of 115° F and above, the only cool air in the outdoor arena was coming from the back of the MultiDyne LiGHTCuBE!" The LiGHTCuBE can be configured with DVI, RGB, and HDMI, enabling PBR to adapt to any signal environment. The powerful solution runs on 110/220 VAC power or batteries for field use. An Anton-Bauer or IDX mounting plate is included. Optical connectors include ST, SC, LC, TFOCA, PH, Tyco Expanded Beam, SMPTE, and Neutrik opticalCON. Test and monitoring features make the LiGHTCuBE especially effective for in-the-field signal monitoring. With an HD monitor and signal generator on either end of the product, PBR can test the circuit even if the camera has not arrived. The HD test signal generator option also allows PBR to send the test pattern down the line, or to send the signal from the studio end directly to the LiGHTCuBE, to monitor the camera output and the signals arriving at the shoot. Measuring at 14-inches cubed, the LiGHTCuBE is compact and portable enough for sports and ENG applications, announce-booth settings, and any field application where signal density is important. Carry handles allow grab-and-go access for remote or on-location productions. A weather resistant cover is available for extra protection. The LiGHTCuBE is compatible with all MultiDyne fiber-optic field transport solutions and is manufactured in the USA. "When broadcasting from a sports arena, there are obvious environmental factors like weather, dirt, and debris that necessitate rugged equipment," said Frank Jachetta, president at MultiDyne. "MultiDyne is well-known in the industry for developing fiber-optic transport equipment built to withstand any operating condition. 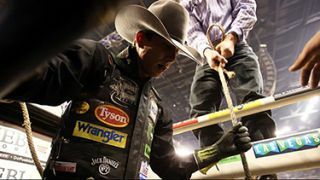 That ruggedness, combined with portability, a high signal count, and advanced test and monitoring features make LiGHTCuBE the best fit for the Professional Bull Riders' broadcast requirements."